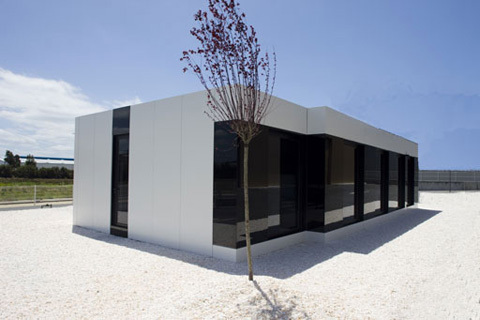 A-cero presents the second modular show house in the spanish city of Ferrol, A Coruña, covered with white aluminum composite and black glass panels. In this occasion A-cero has chosen a different façade from the Madrid show house´s. In that way people can see different options that A-cero offers with these modular houses. This time A-cero has designed a combination of black glass with panels of white aluminium Larson composite. The house has a modern and clean design with the same avant-garde style of the modular house already built in Madrid (that one has a black glass facade). 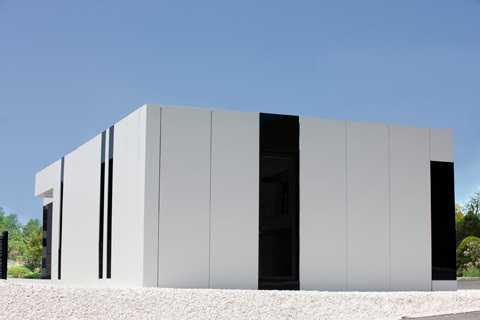 However, the new modular house has a freshness and clarity touch due to the white colour. Also, the white gravel in the house’s surface accentuates this luminosity sensation. This material is a very affordable and comfortable solution for the owners. Apart form the “closing extra”, this house has been presented without extras in order to emphasize the house´s structure and give the main role to the excellent quality of its materials and finished. The house has a 106 m2 area. It includes three bedrooms, two baths, hall, lounge – dining room, laundry room and kitchen. It costs 99.000 euros. 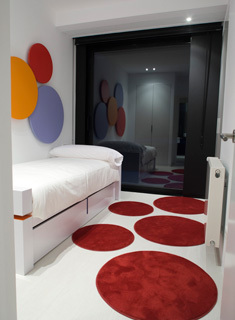 The house´s furniture has been designed by A-cero. It has been created looking for a functional and modern aesthetics. 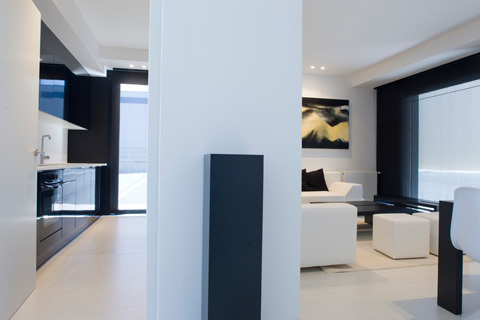 The house´s decoration is led by the Mercedes Rodríguez pictures, whose abstract and evocative works generally are in every A-cero´s projects. A-cero has presented this second modular show house after the first successful modular house which was presented last February in Madrid. Indeed, nowadays ten modular houses are being built (for private costumers) and several promotions will be built the next September. Almost 2.000 budgets have been prepared up to the date too.